For all its convenience (seriously, stop calling me unless its an emergency!) texting is pretty boring, frankly. At least it is on SMS. It explains why so many other messaging services are so popular, and why a company like WhatsApp can amass 900 million users. For the rest of us, though, which number in the billions, we're stuck with something pretty drab. That may not be the case on Android much longer, as Google announced a new initiative on Wednesday, away from SMS and toward Rich Communications Services (RCS), which it calls "a new standard for carrier messaging." RCS will bring with it features that people now expect from mobile messaging. That includes group chats, and high resolution photos. Google said that it would be teaming up with mobile operators, device makers and "the rest of the Android ecosystem to support RCS standards and help accelerate their deployment in a more consistent way." Of course, the best way to implement something like this is to bring on a team that has expertise in this area, so Google also revealed that is has acquired Jibe Mobile, a messaging startup that builds cloud communications for mobile operators. No financial terms of the acquisition were disclosed. 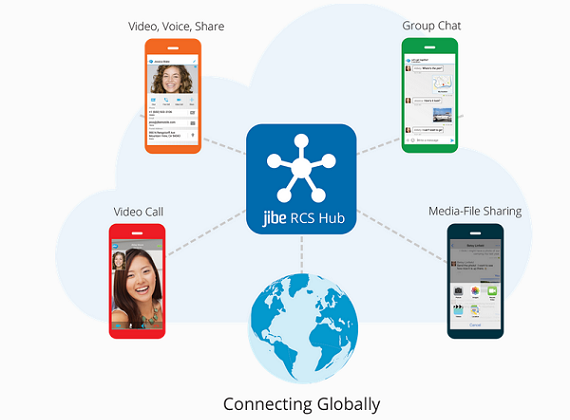 Founded in 2007, Jibe Mobile is a company that allows carriers to deliver rich IP-based communications services, including high quality video calling, group chat and large media-file sharing to any network, device, or region. Jibe Mobile customers include U.S.-based Sprint and leading European carriers Deutsche Telekom, Vodafone, KPN, and SFR. "As the mobile world was opening up, we had a hunch that carriers had to become more competitive by becoming innovative. So we decided to start a company with the vision of bridging the newer world of Silicon Valley with the older world of telecommunications," he said. "In 2010, we foresaw the future of messaging and invested heavily in Rich Communications Services (RCS), the new standard that was being positioned as the evolution of SMS. We then introduced the Jibe model to put carrier messaging in the cloud and flip the infrastructure business model upside down." Jibe Mobile is currently headquartered in Mountain View, with offices in London and Dusseldorf. It is unclear what will happen to the company going forward, if it will remain operating or if it will be shutting down. Neither side has mentioned whether Google is acquiring Jibe's technology or its team. VatorNews has reached out to Google and to Jibe Mobile for further comment. We will update this story if we learn more. Jibe had raised $9.1 million in venture funding, most recently a $8.3 million round in December 2012. Investors included Vodafone Ventures, the U.S. investment arm of Vodafone Group, as well as Tokyo-based game creator MTI. This is Google's tenth acquisition so far in 2015. It previously purchased kids app-maker Launchpad Toys; photo-backup service Odysee; mobile payments app Softcard; Facebook marketing tool Toro; VR companies Tilt Brush and Thrive Audio; and smart scheduling app Timeful. It bought mobile app performance service Pulse.io in May, and Pixate, a company that enables dynamic user interfaces for native mobile applications, in July. It's most recent purchase was of ebook company Oyster earlier this month. jibe is a startup based in San Mateo, California. We allow you to take your personal media with you on your mobile device and allow you to easily share your media with friends.